Wondershare iCollage for Mac is a expert Mac photo editing software. With vaious theme templates, you can edit photos into scrapbook, calender, card, etc. Strong editing functions including effect, mask, adjust, etc. can assist you to decorate photos as you like. After editing, you can export the photos into image, upload to Flickr, Facebook, email to your friends or even print them out. This considerate Mac scrapbook app can meet all your needs! ...... sticker, bubble text, etc. 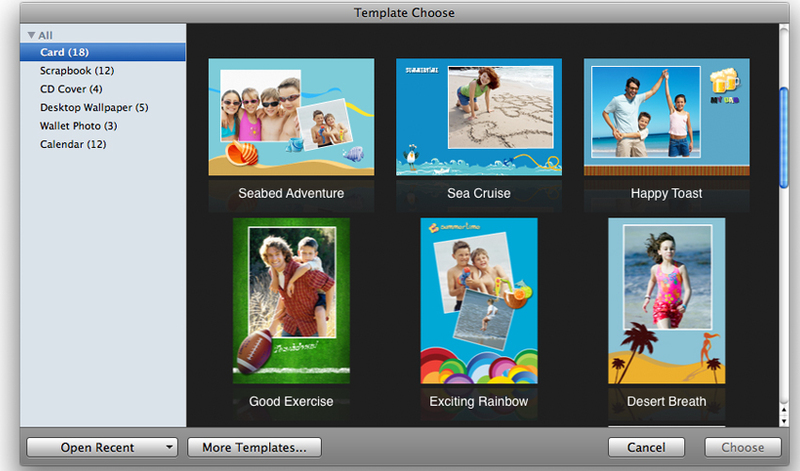 Wondershare iCollage for Mac will offer you multi-choice in outputting your scrapbook on Mac. Sharing the printed page, sending it as mail, publishing it to Facebook, Flickr or iWeb, iCollage as considerate Mac scrapbook software can meet all your needs! 7. With Magic Collage function: can easily build photo collage in three steps. Qweas is providing links to Wondershare iCollage for Mac 1.8.6 as a courtesy, and makes no representations regarding Wondershare iCollage for Mac or any other applications or any information related thereto. Any questions, complaints or claims regarding this application Wondershare iCollage for Mac 1.8.6 must be directed to the appropriate software vendor. You may click the publisher link of Wondershare iCollage for Mac on the top of this page to get more details about the vendor.